Premium RO + DI water system with competitive prices. Designed and Made in USA. KoolerMax 6-stage 2 outputs 120GPD Reverse Osmosis + DI Water System for Aquarium + home drinking water. This is a 6-stage Reverse Osmosis water system that is designed to purify the tap water into ultra-pure water for Aquarium Reef and clean and good tasting water for home drinking. How does it compare to other brands? Short Answer: way-better, reliable and guaranty to perform. After extensive research, testing, and collaboration with component manufacturers, we have come up with this U.
Patented designed that is packed with improvement and enhancement. This new RO system is loaded with upgraded components to improve its function and capability. It performs better than any typical RO system in its class. Bonus pressure gauge is installed in the system: The pressure gauge is installed on the bracket after stage 3 to monitor the operating pressure. When the system is making water, it indicates the operating pressure. When you see a pressure drop of 15 psi, that means the filters are clogging up, need replacement. 1st stage 5micron muti-layer sediemtn filter; outer layer is 20 micron and inner layer is 5 micron which results in higher dirt and sediment holding capacity. 5 micron coconut shell carbon block filter for greater chlorine and chemical removal. Upgraded faucet are now standard: The stylish dispensing faucet with ceramic disc shut-off are now standard. It is a lead-free faucet. This upgrade ensures the longevity of its function and enhancement of aesthetic. Water supply/feed water adapter: Now we give you two sizes of water supply adapters, 1/2" MPT and 3/8" compression. Since newer plumbing under the sink and newer kitchen faucets are using 3/8" compression fitting, we now also include a brass type 3/8" compression adapter. Clear housing for the first stage sediment filter: Using the clear housing is an easy way to tell if the first stage sediment filter is getting dirty or clogging up. New design of auto-shut-off valve: It looks the same outside but it's new seal design provides more accurate shut-off and higher shut-off pressure. Color tubing, 4 section of 5 feet each 1/4. 1/2 MPT feed water adapter. Inline ball valve, on/off for water supply. 3/8 compression feed water adapter. This is a complete system ready to be installed. It includes all filters, storage tank, faucet, tubing, installation hardware, installation manual. Is the preferred partner of Honeywell, Watergeneral, Koolermax, Aquatec. We also guarantee the performance of the RO systems. We carry all parts and components. This is a complete system with all filters, storage tank, faucet, tubing, feed water adapter, drain saddle valve, installation manual. 1st stage: high capacity, 5 micron sediment filter. To remove sediment, rust, sand, (replace every 6 - 12 months). 2nd stage: high capacity carbon filter , coconut shell carbon block filter removes chlorine, taste, & chlorine (replace every 6 - 12 months). 3rd stage: high capacity carbon filter. Coconut shell carbon block filter further removing chlorine to ensure 100% removal of chlorine (replace every 6 - 12 months). 4th stage: TFC-150 Premium membrane. We use genuine US MEMBRANE membrane filter, 75-150gal/day, it removes 95% of all chemical, dissolved solids in tap water. (replace every 2-3 years, about 3000 gallons of water you make). 5th stage: inline refillable clear DI filter : color-changing DI resin, nuclear grade DI highest quality; to remove the remaining mineral after the 4th stage. (replace or refill every 500 gallons, refillable with DI resin). 6th stage: high capacity final stage inline carbon filter , granular activated carbon, to improve taste of water. Dimension : RO unit, 15" width, 16" height, 5.5" depth; pressure tank, 9" diameter 14 height. All reverse osmosis systems, residential or commercial, are required to have drain water when making pure water. Our RO systems have built-in auto-shut-off valve so when the storage tank is full, the system shuts off automatically. The ratio of pure water to drain water for our RO systems are 1:3 (calculated). Average RO systems are typically 1:4, so our RO systems run more efficiently. Minimum water pressure required to operate the system is 45 PSI. Ideal pressure is 85 PSI. This system is intended to be operated with under 400 ppm tap water. If you have higher ppm in the water, the purified result will be affected and we can not guarantee the purification ratio. 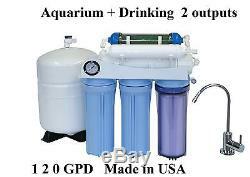 The item "Aquarium Drinking 120GPD REVERSE OSMOSIS RO+DI WATER FILTER SYSTEM USA Made 125" is in sale since Friday, March 21, 2014. This item is in the category "Home & Garden\Kitchen, Dining & Bar\Small Kitchen Appliances\Water Purification\Water Filters". The seller is "filterdirect" and is located in Santa Ana, California. This item can be shipped to United States, Canada, United Kingdom, Denmark, Romania, Slovakia, Bulgaria, Czech republic, Finland, Hungary, Latvia, Lithuania, Malta, Estonia, Australia, Greece, Portugal, Cyprus, Slovenia, Japan, China, Sweden, South Korea, Indonesia, Taiwan, Thailand, Belgium, France, Hong Kong, Ireland, Netherlands, Poland, Spain, Italy, Germany, Austria, Israel, Mexico, New Zealand, Philippines, Singapore, Switzerland, Norway, Saudi arabia, Ukraine, United arab emirates, Qatar, Kuwait, Bahrain, Croatia, Malaysia, Colombia, Costa rica, Dominican republic, Panama, Trinidad and tobago, Guatemala, El salvador, Honduras, Jamaica, Bahamas, Viet nam.